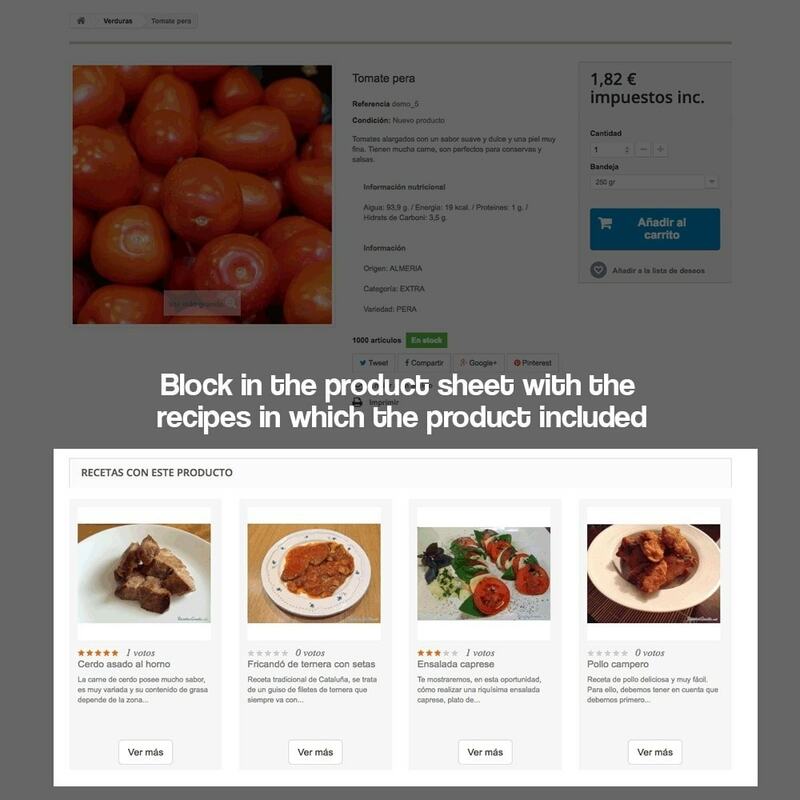 Your customers will get all the information on how to use the products of your store to create recipes with them, giving them access to all the products needed for each recipe. 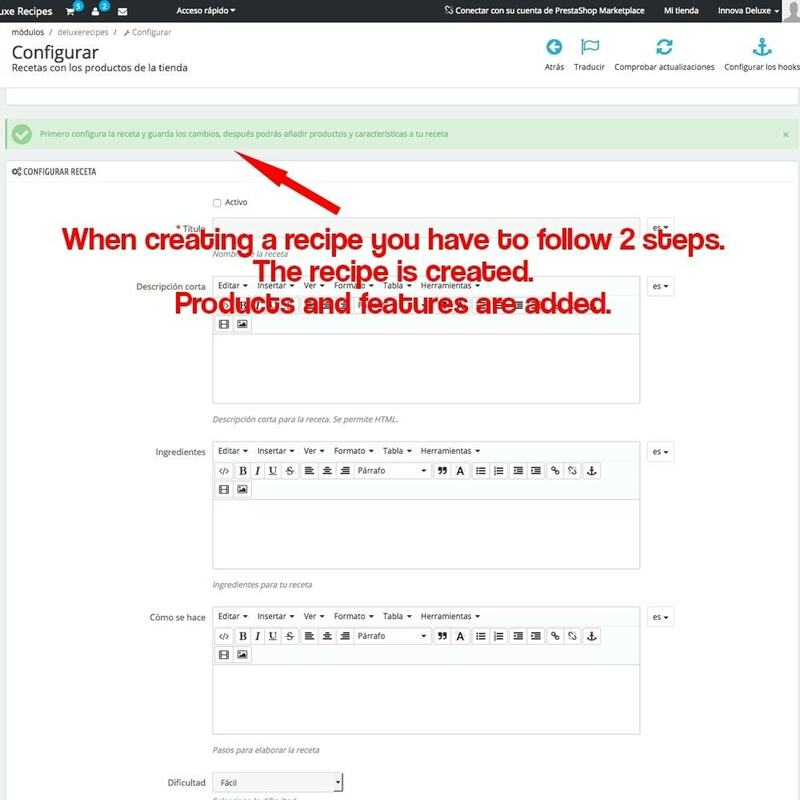 You can also check other recipes related to the same products, so you can give a greater advantage to those products if you have leftovers in that recipe. 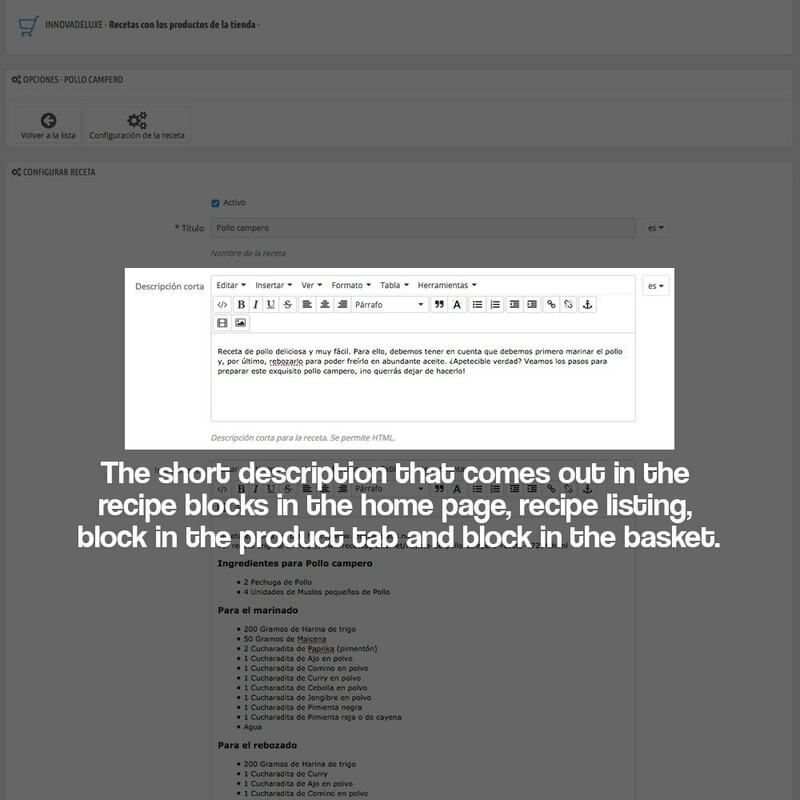 With this module you will get your customers to significantly increase the average value of their baskets, since they go from buying loose products to buying large lists of products to be able to carry out the recipes they offer with this module. 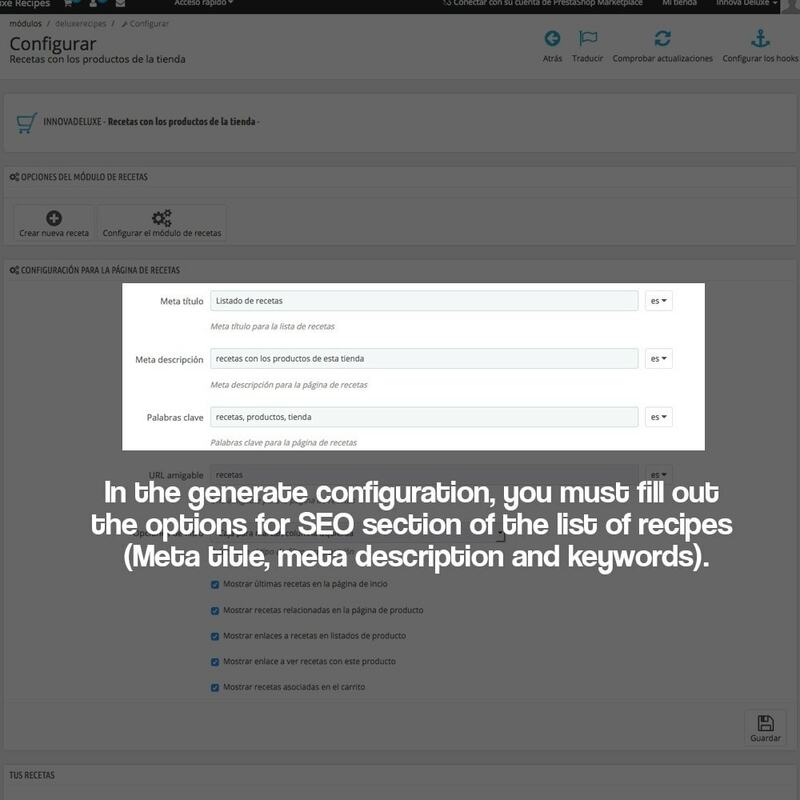 In addition, this module will significantly increase search engine rankings (SEO) by creating interesting and relevant content for visitors, making the time spent in the store much higher and lowering the rebound rate, which will make it Increase the notoriety of the domain. 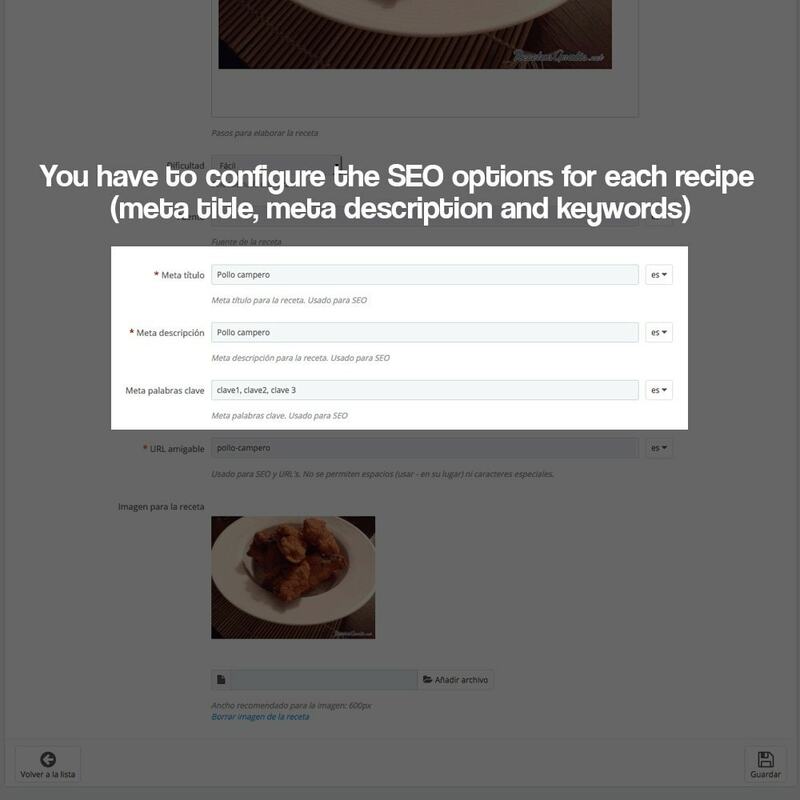 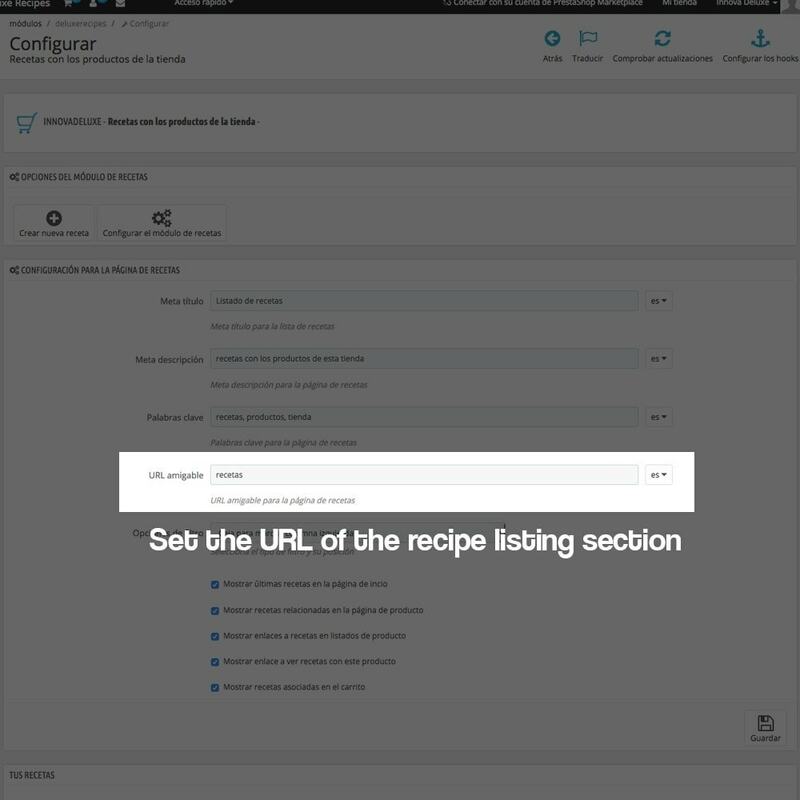 The manager of recipes, will allow you to make marketing of content of the highest quality and relevant content for your customers who will thank you, so you do not have to look for recipes elsewhere. 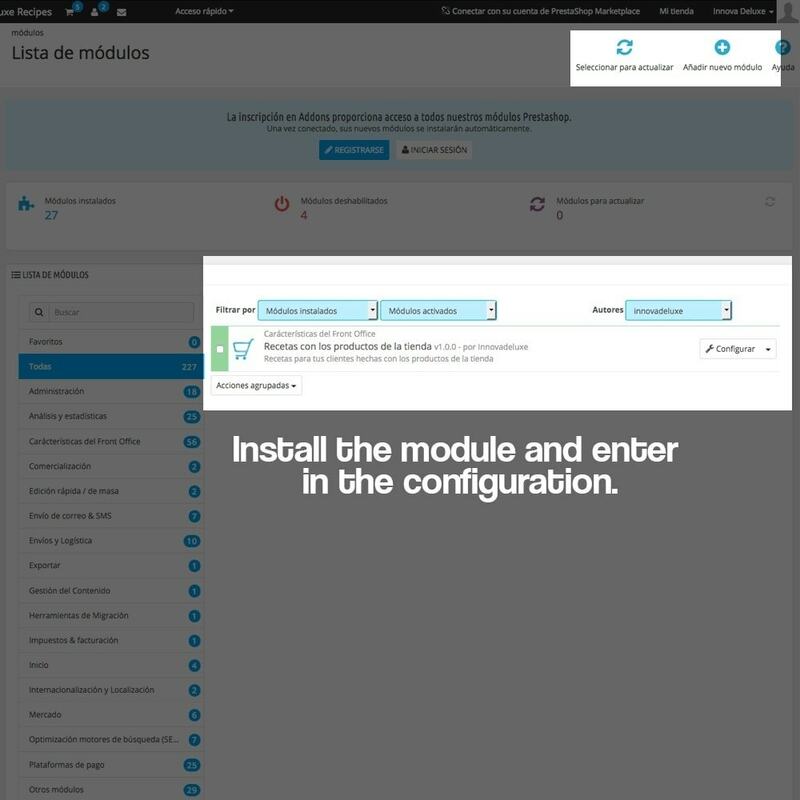 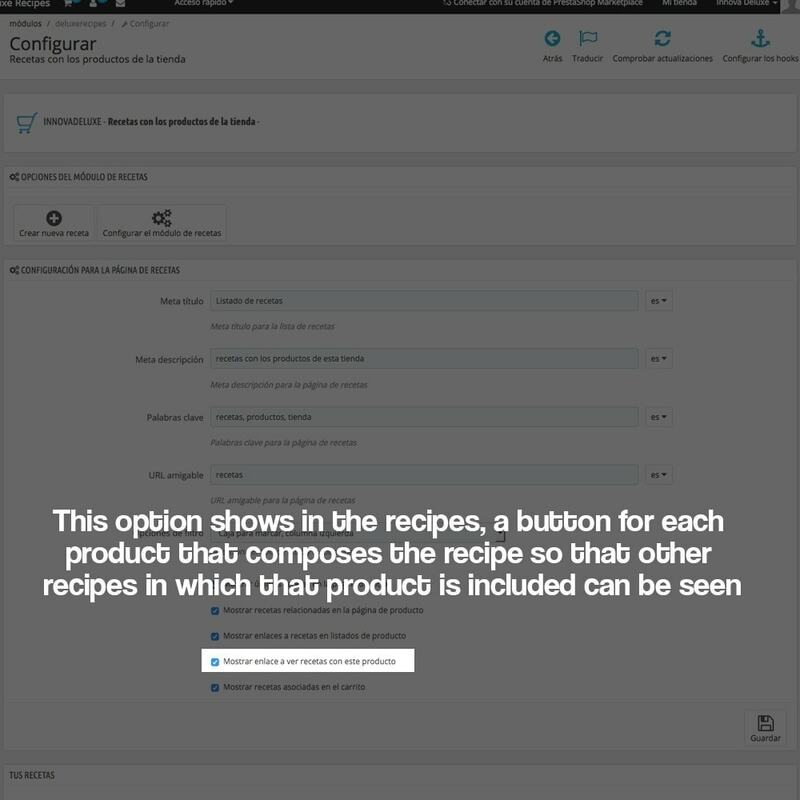 The module includes a filter by features so your customers can find the recipe they need, so this module will give the customer an excellent user experience, not to waste time in finding what they need. 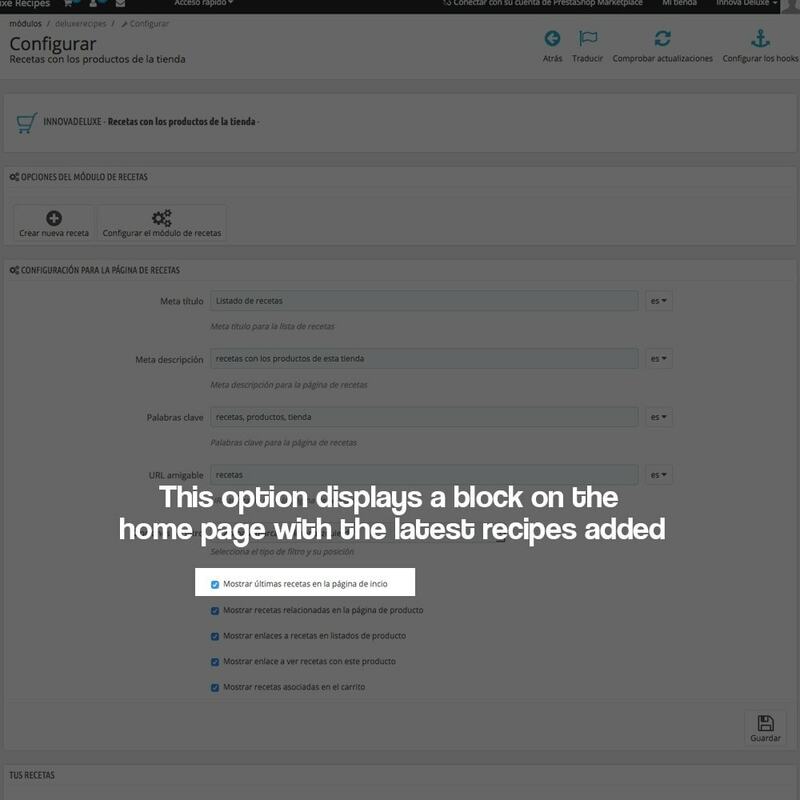 The module allows you to filter by different options such as difficulty, the cost of the recipe or the time it takes to complete it. 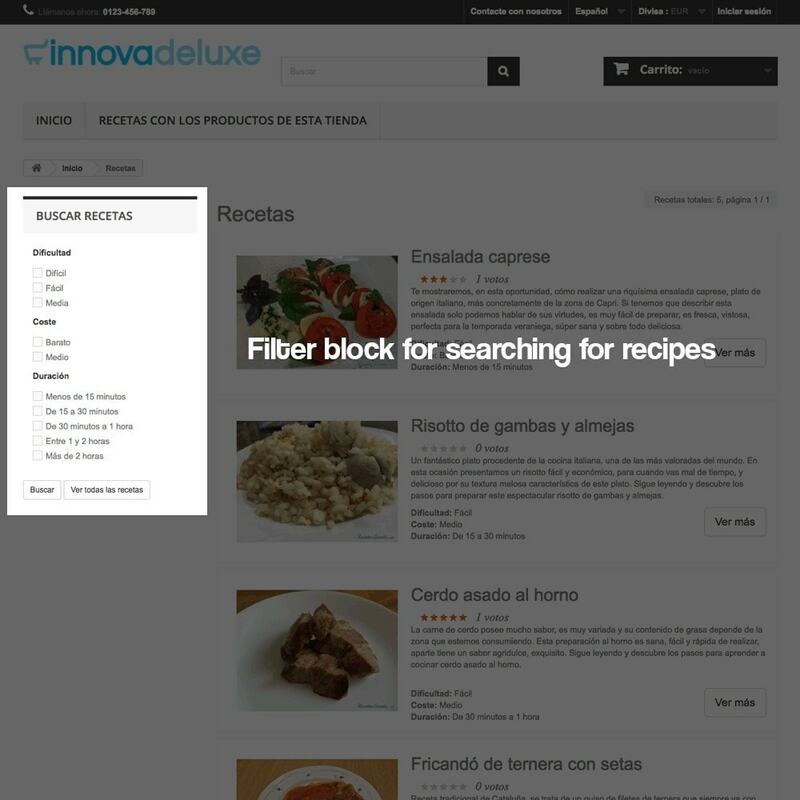 You can indicate how you want the filter block to be displayed, by dialable or by drop-down options. 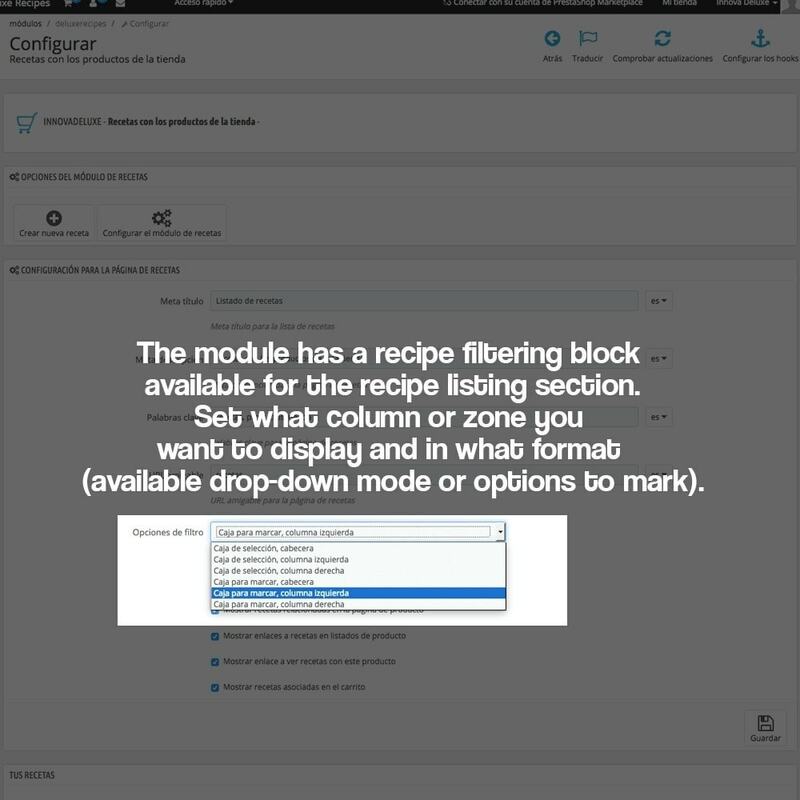 You can configure where you want the filter block to be displayed, in the section header, in the right or left column. 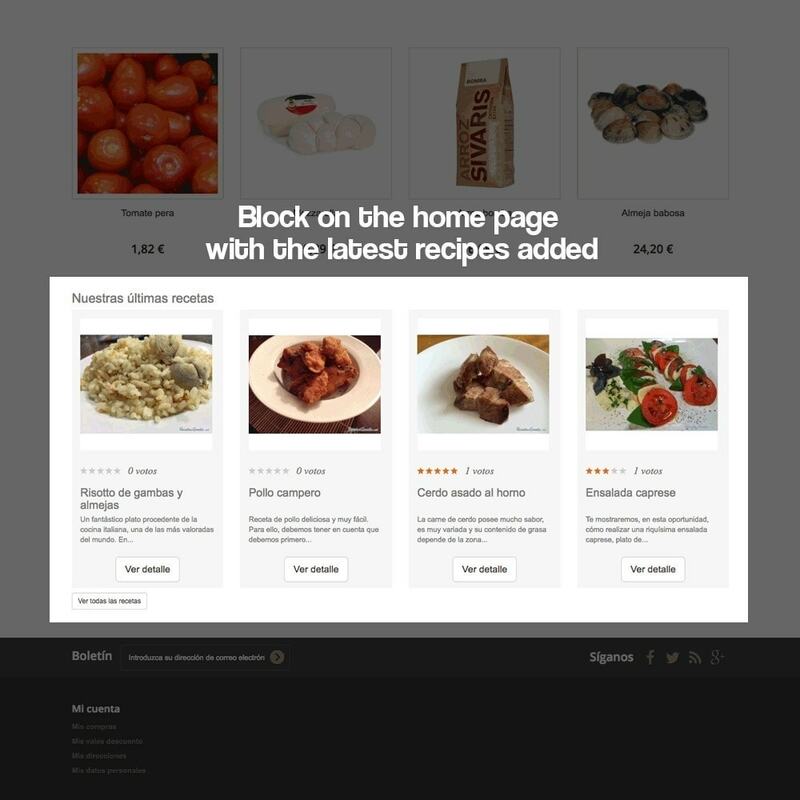 You can display a block on the home page with the latest recipes added. 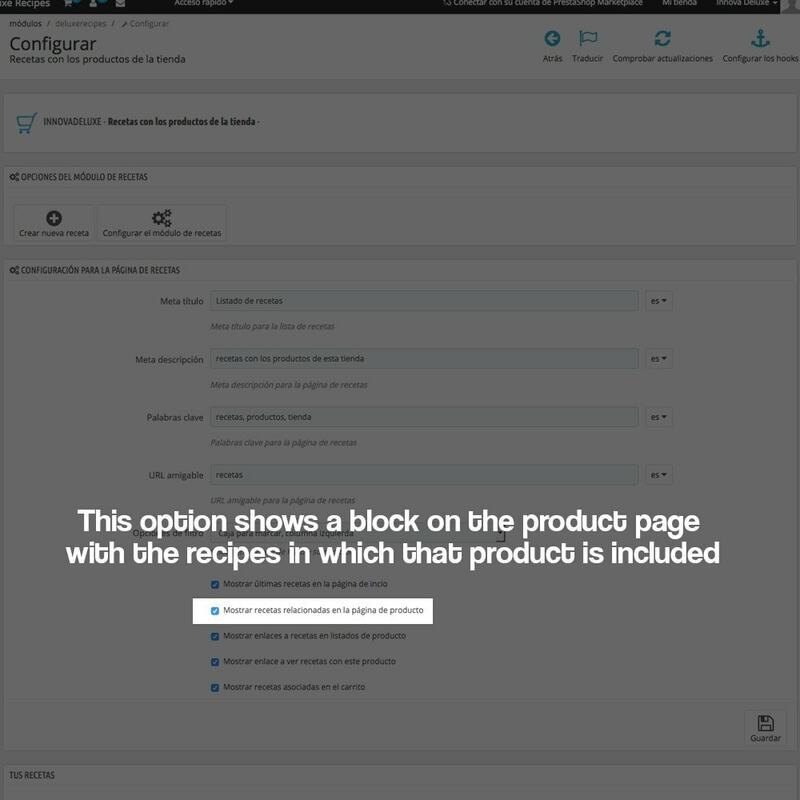 You can display a block in the product listing with all the recipes in which that product is included. 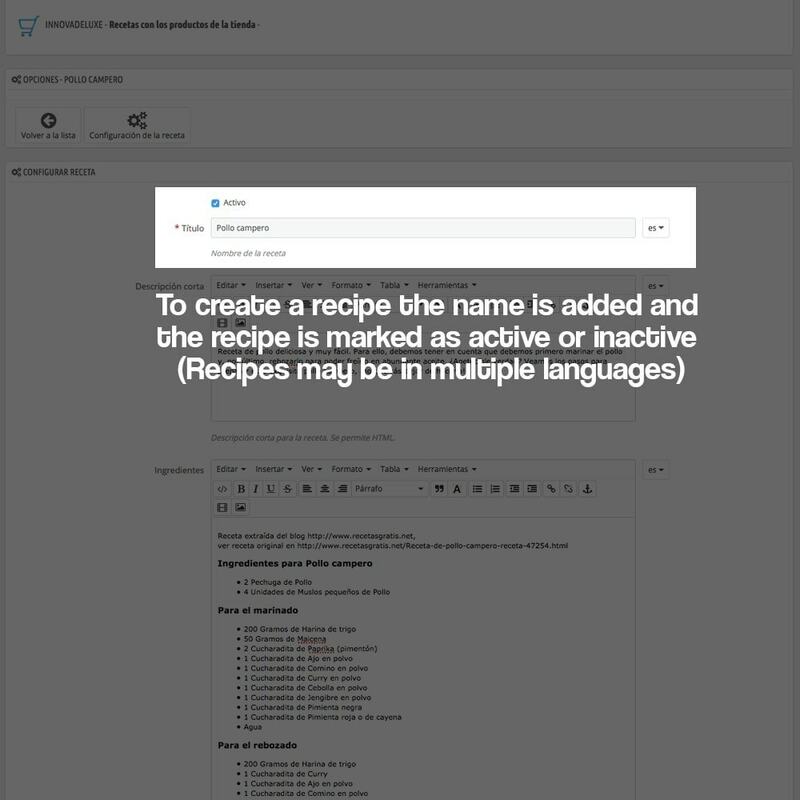 You can show related recipes to the products that are included in the recipe you are viewing. 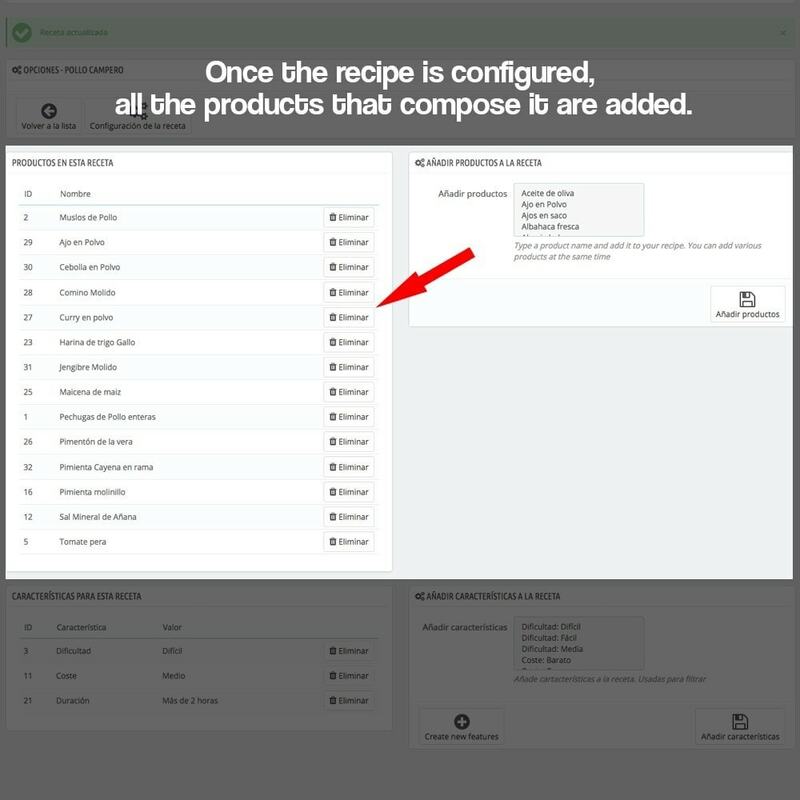 You can display a button for each product in a recipe, which takes you to all the recipes in which that product is included. 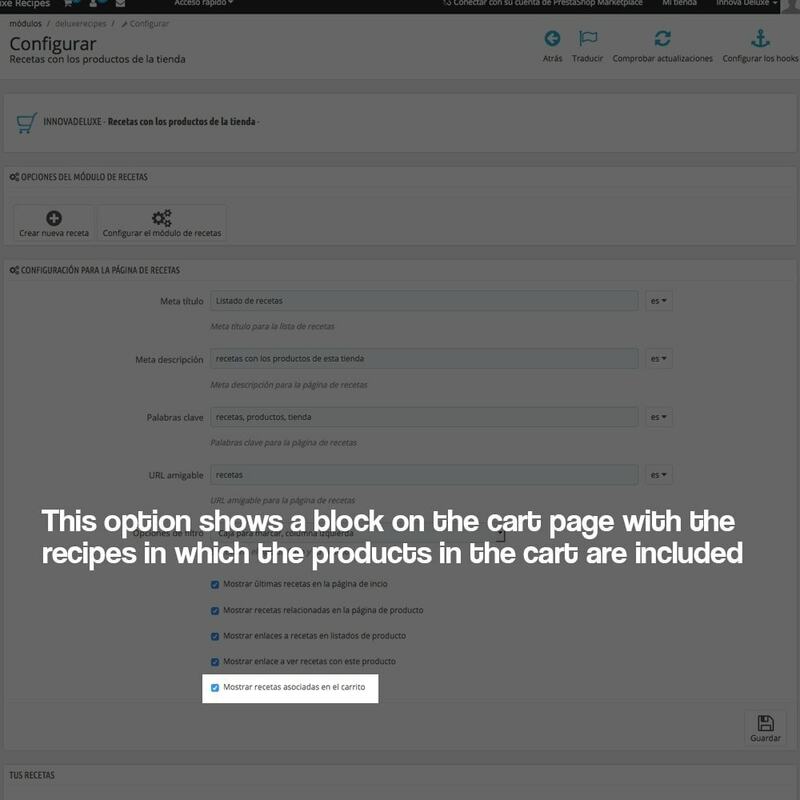 You can display a block on the cart page with related recipes to the products that you have added to the cart. 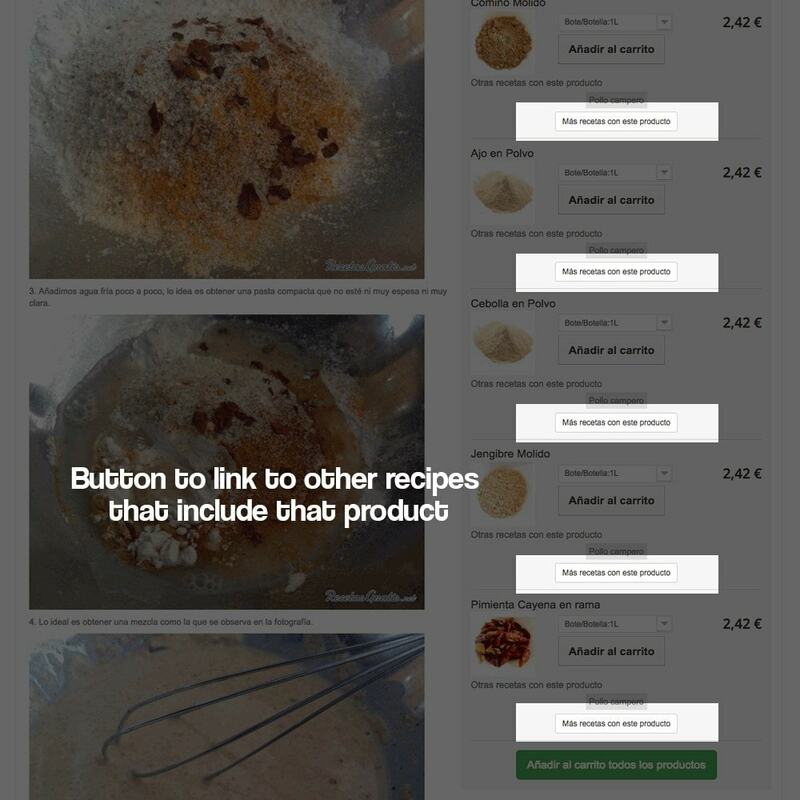 You can enter a short description for the recipe, it will come out in all the recipe listings and on the recipe page. 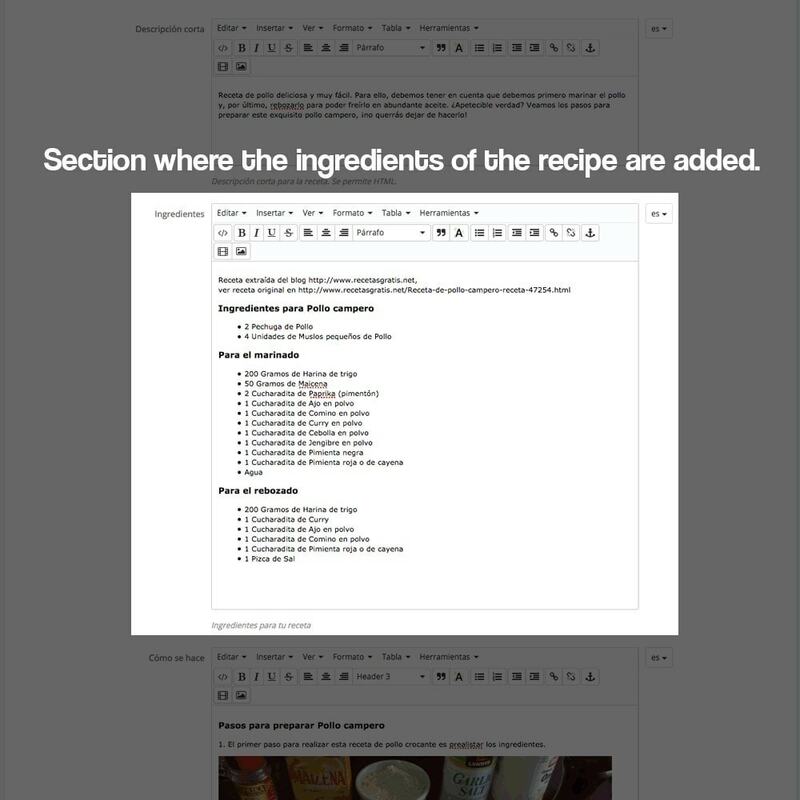 You have a block to add all the information for the ingredients and their quantities. 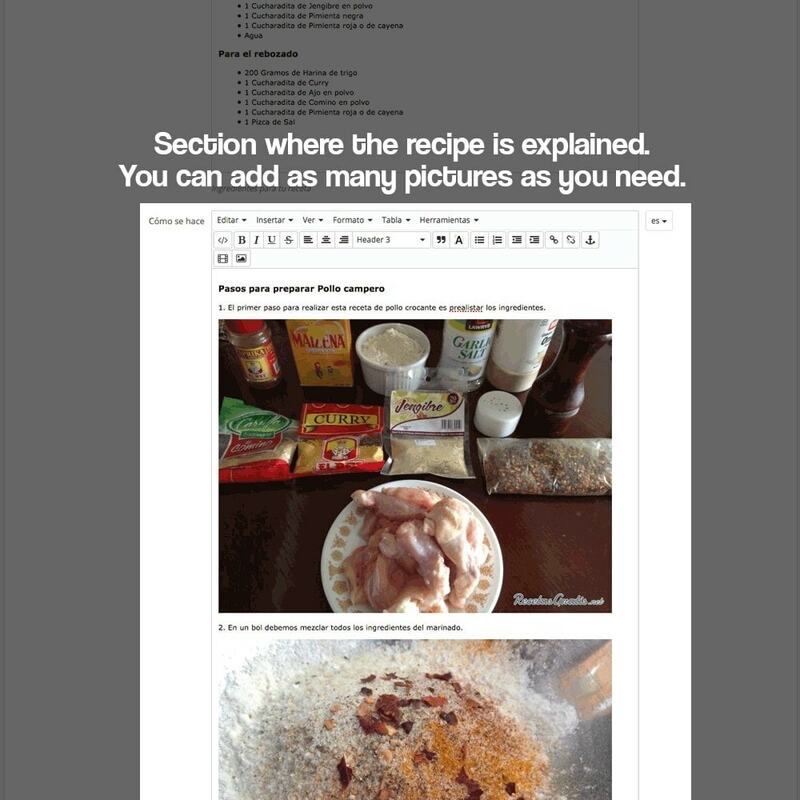 You have a block to add the texts and necessary images to explain the steps to follow to make the recipe. 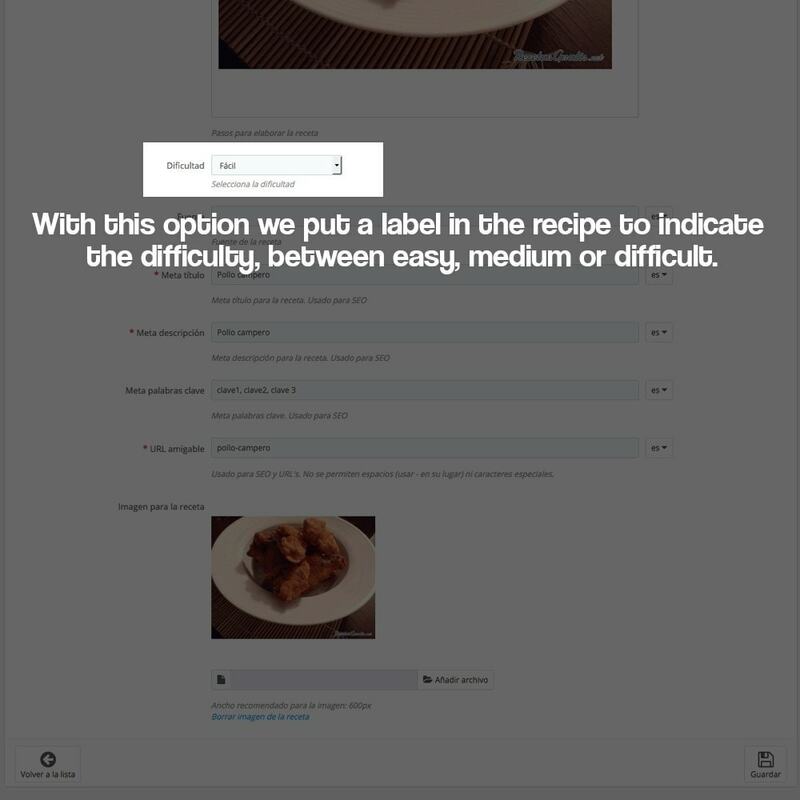 You can put a label in the recipe indicating the degree of difficulty (easy, medium or difficult). 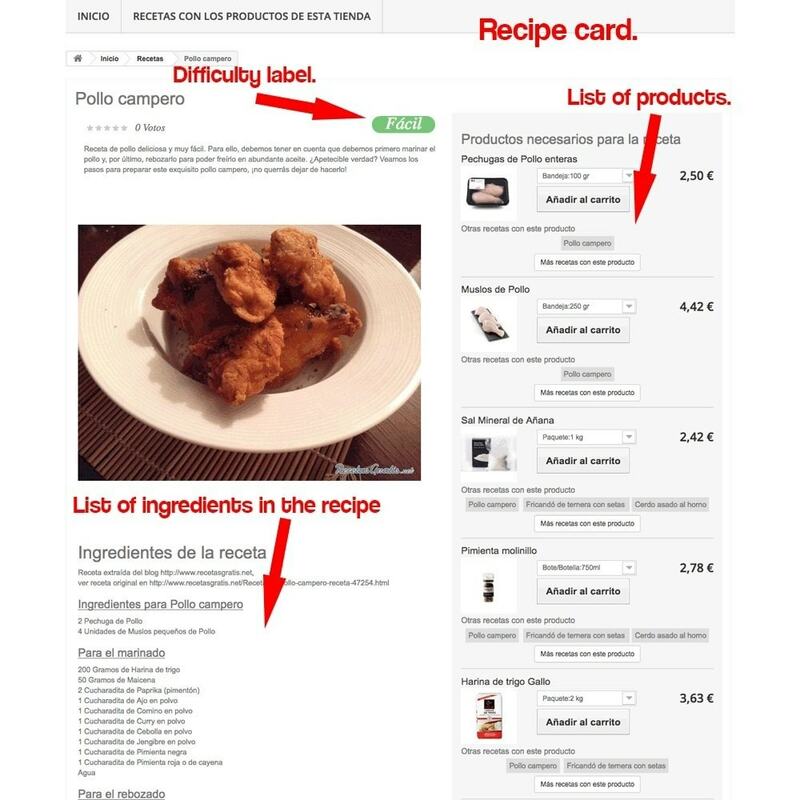 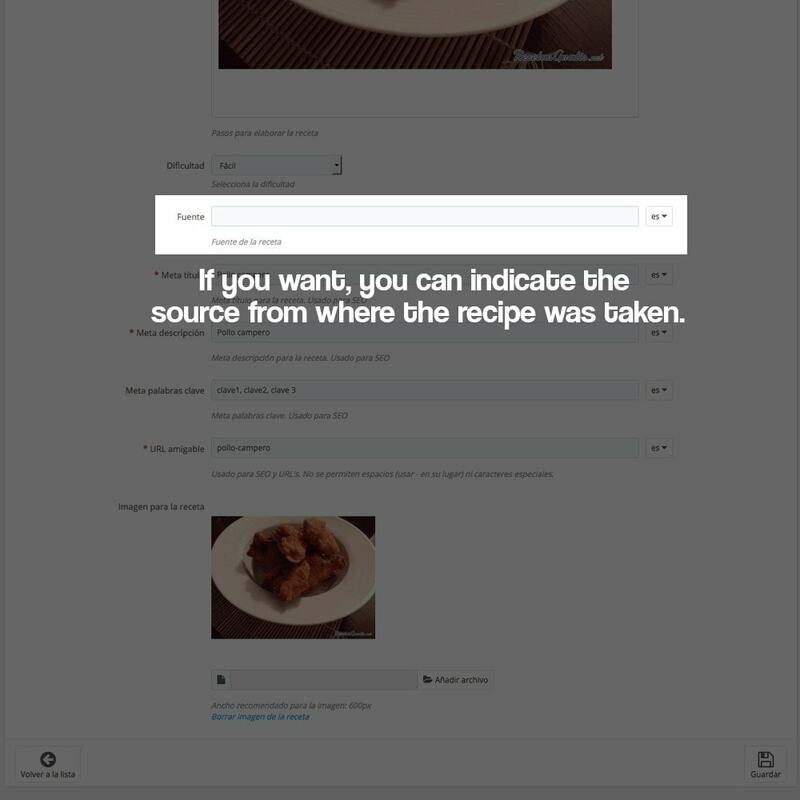 You can indicate the source of where you took the recipe in case you want to refer to it. 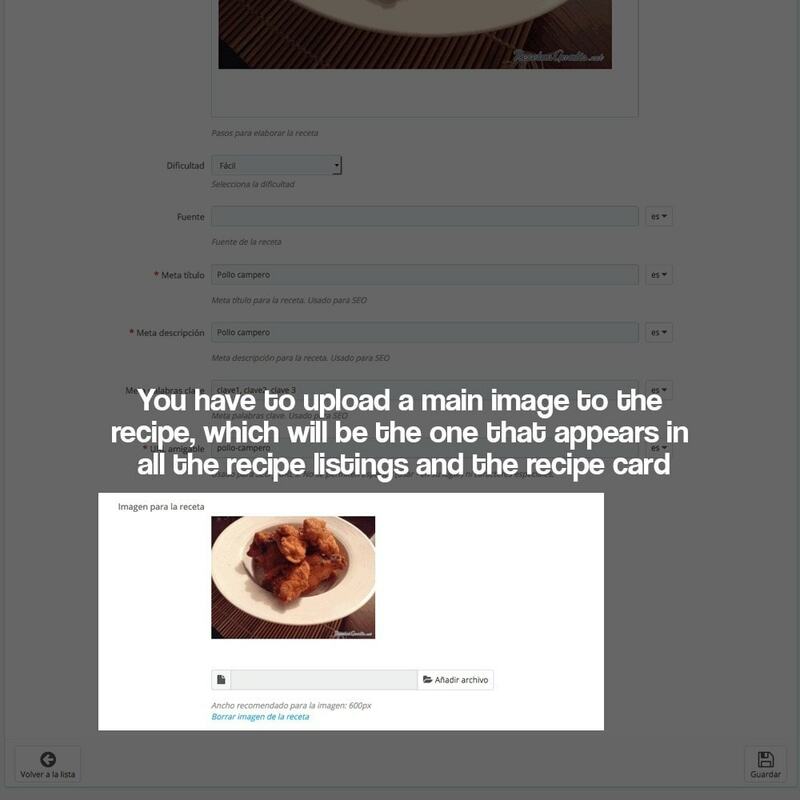 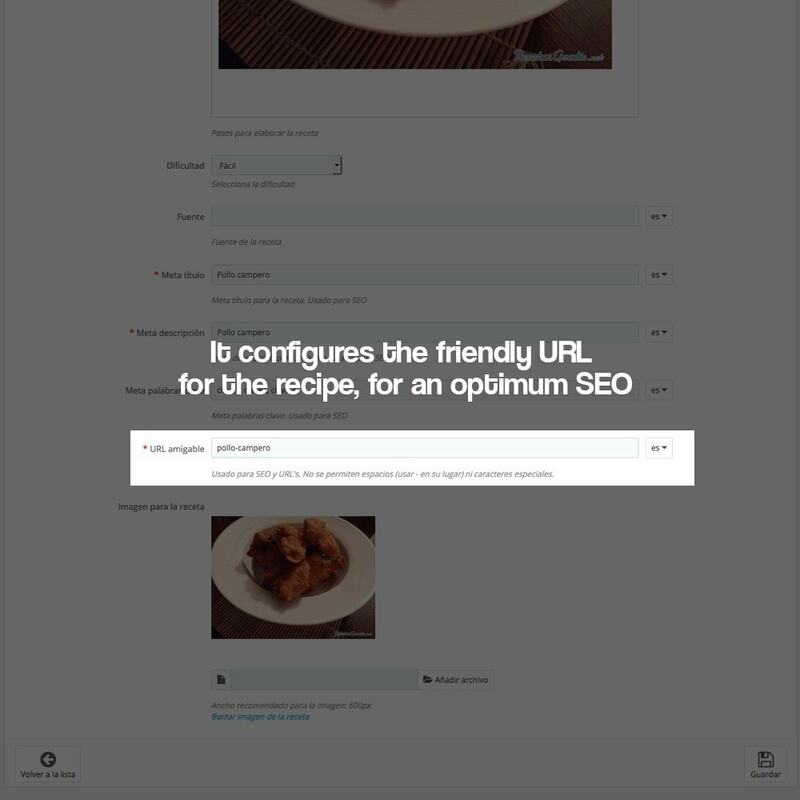 You can upload a main image for the recipe, it will come in all the recipe listings and also as the main image on the recipe page. 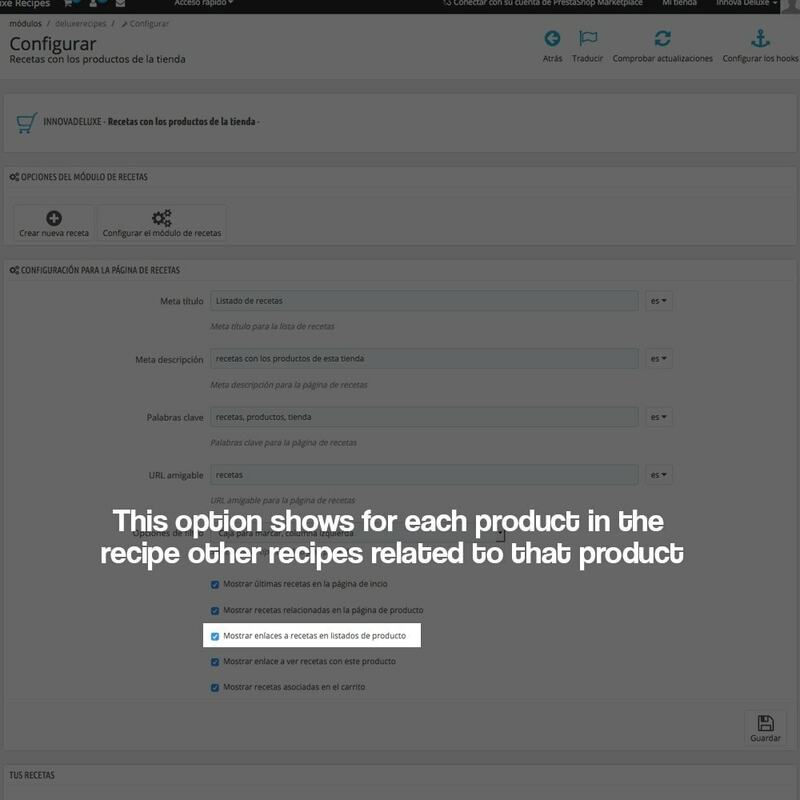 You can select which products from the store are used in the recipe so that the customer can buy them directly from the recipe page. 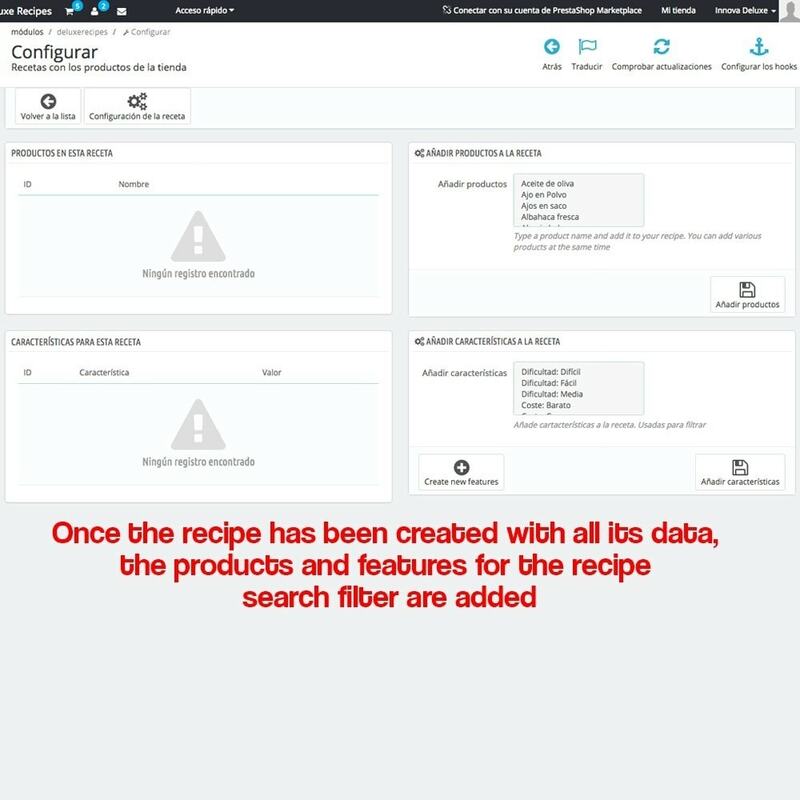 You can configure the characteristics by which customers can find the recipe using the filter. 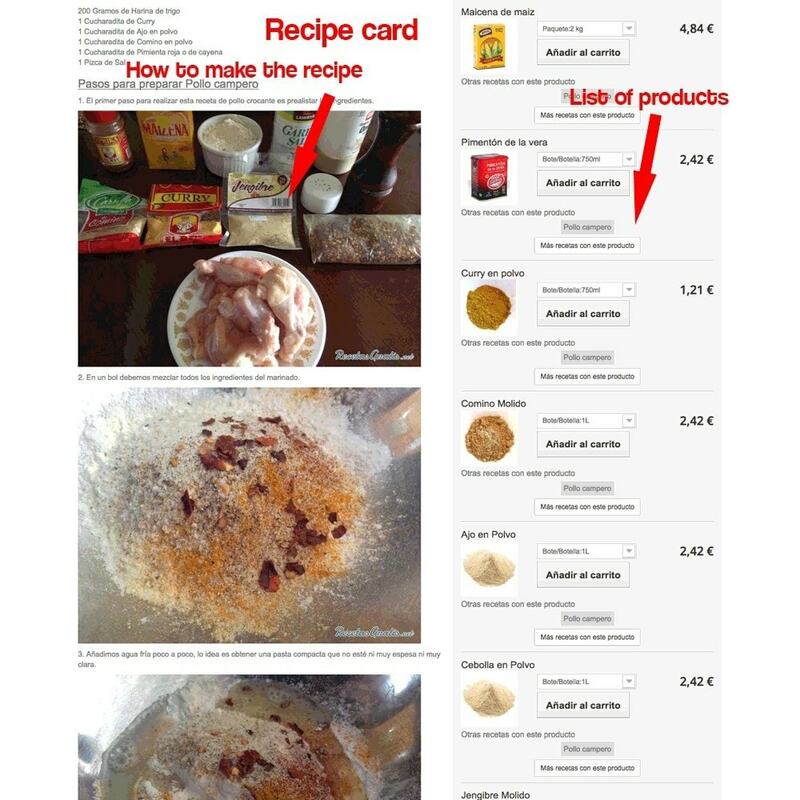 You have three types of characteristics, "Difficulty", "Cost" and "Duration". 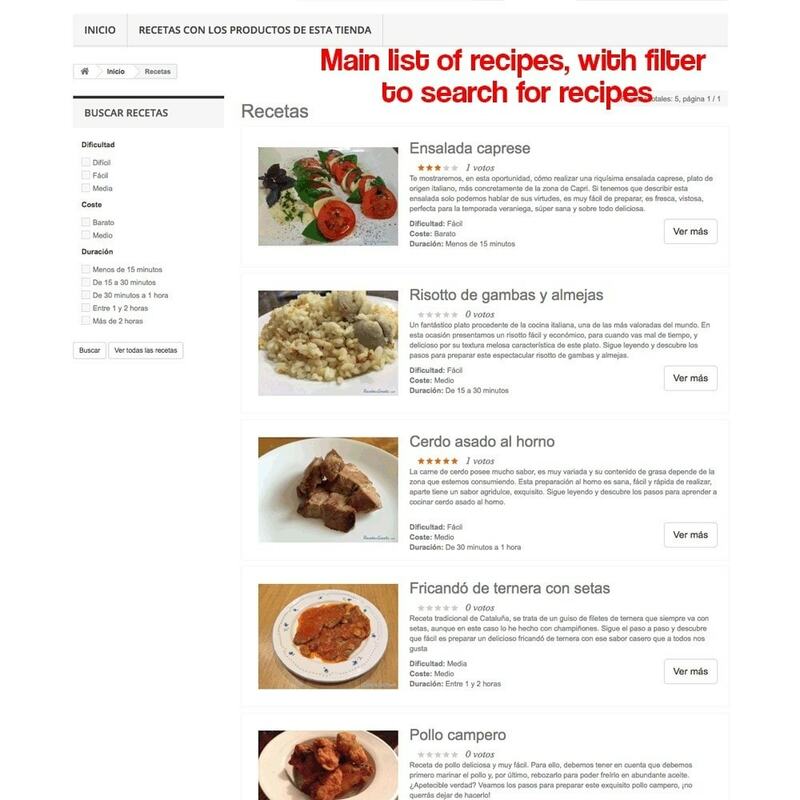 Customers can rate star recipes, which appear in recipe listings and recipe listings. 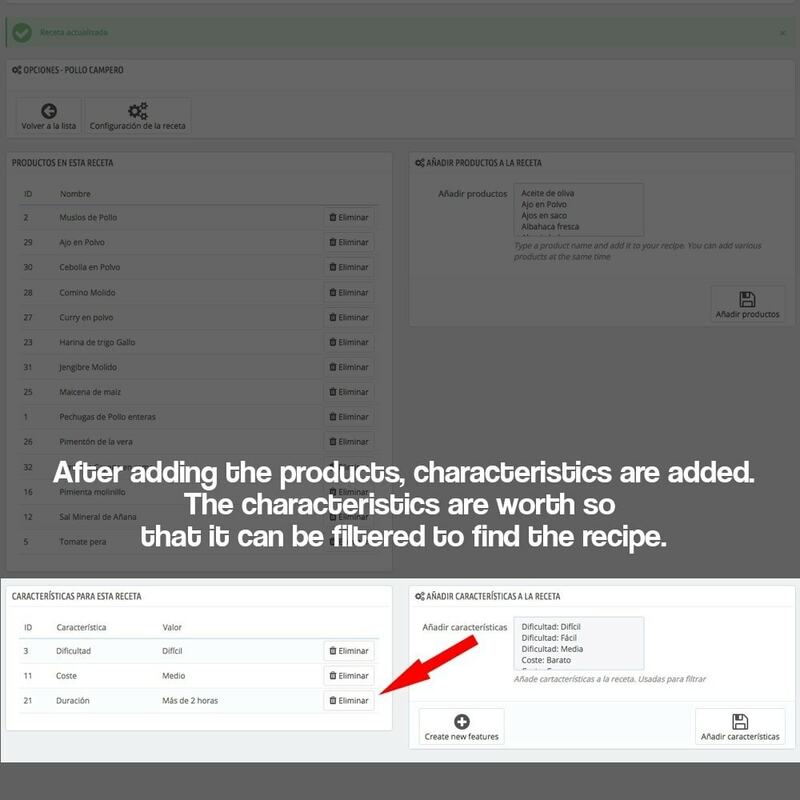 In the product list of a recipe, you can select the attribute combinations of each product, for example a customer that want to buy a combination with a higher o lower size. 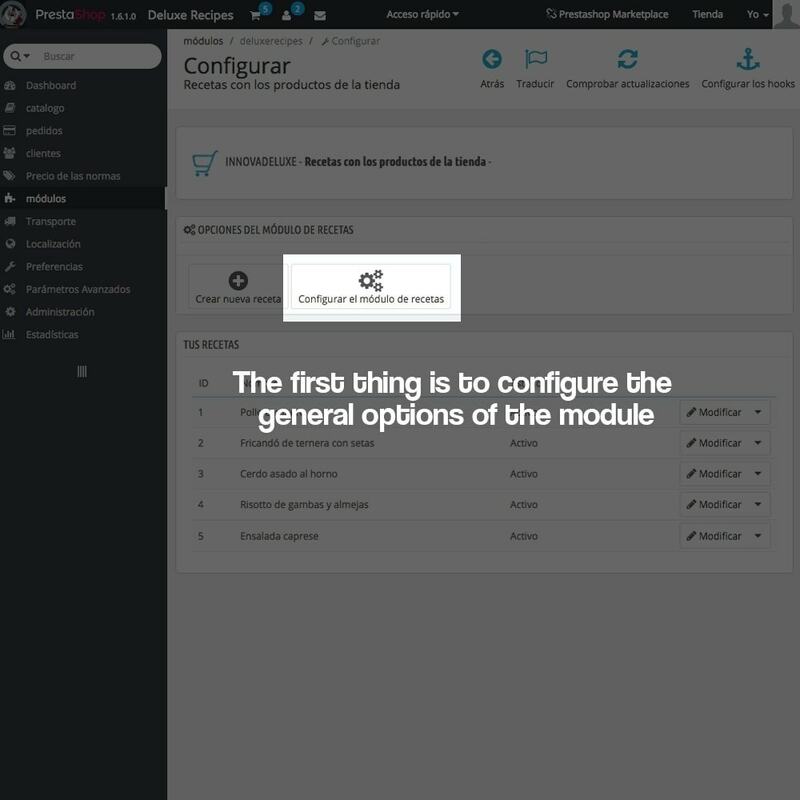 Con questo modulo potrai far visualizzare pulsante per aggiungere prodotti nel carrello che manca nelle diverse liste dei prodotti e nelle categorie dei prodotti. 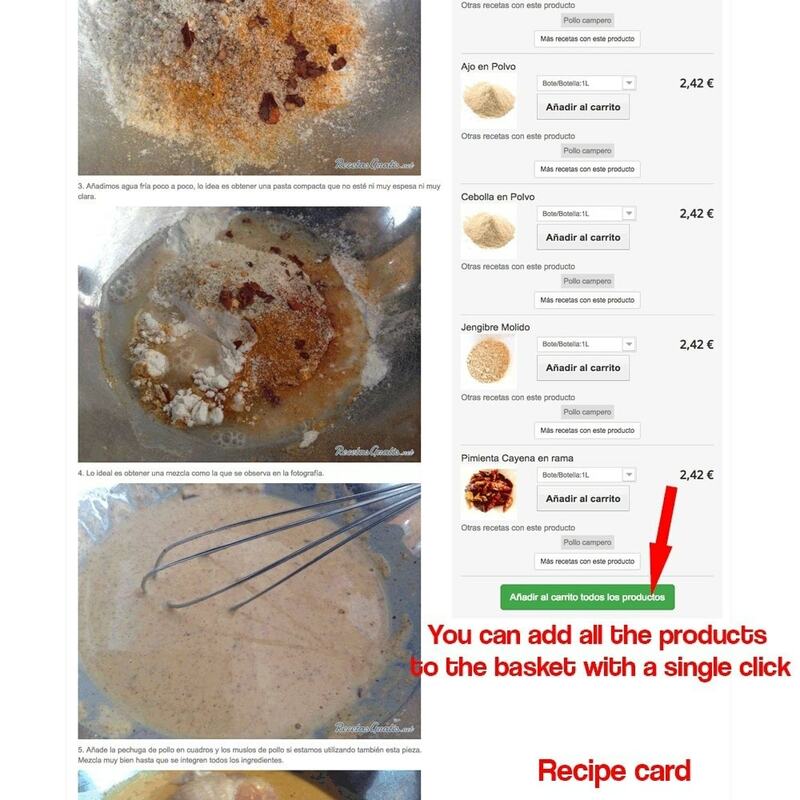 Perfino puoi utilizzare impostazioni avanzate per decidere proprio design del tasto. 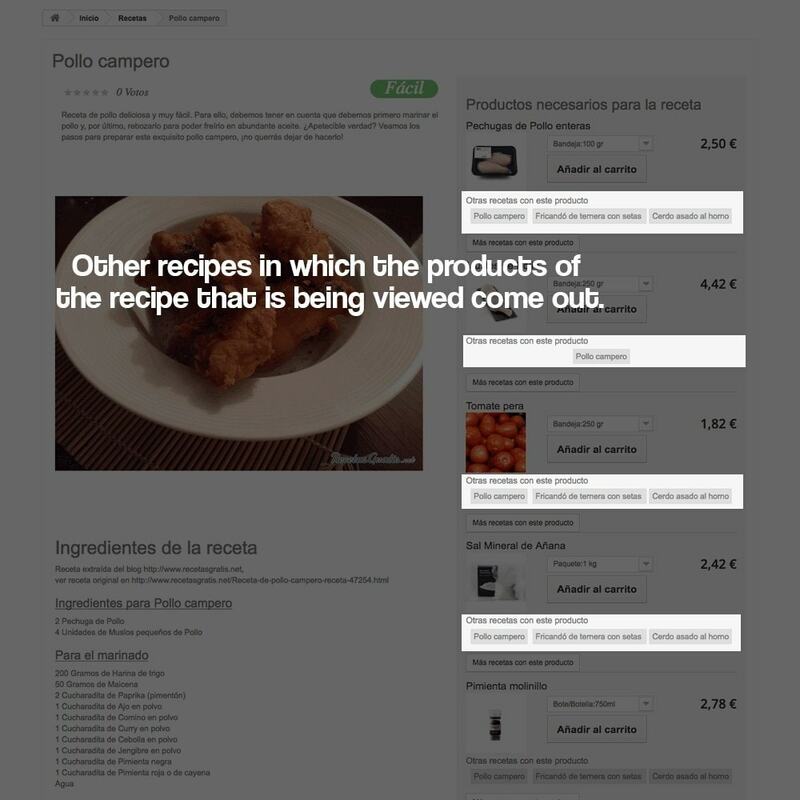 Your customers will be able to get quality recipes with the products that they are going to buy in your store, in addition they will be able to find them easily thanks to the filter of search, since it will allow them to find recipes that fit for example while they have available for cooking, to its Skills as cooks or the cost they want to pay for the product for the recipe. 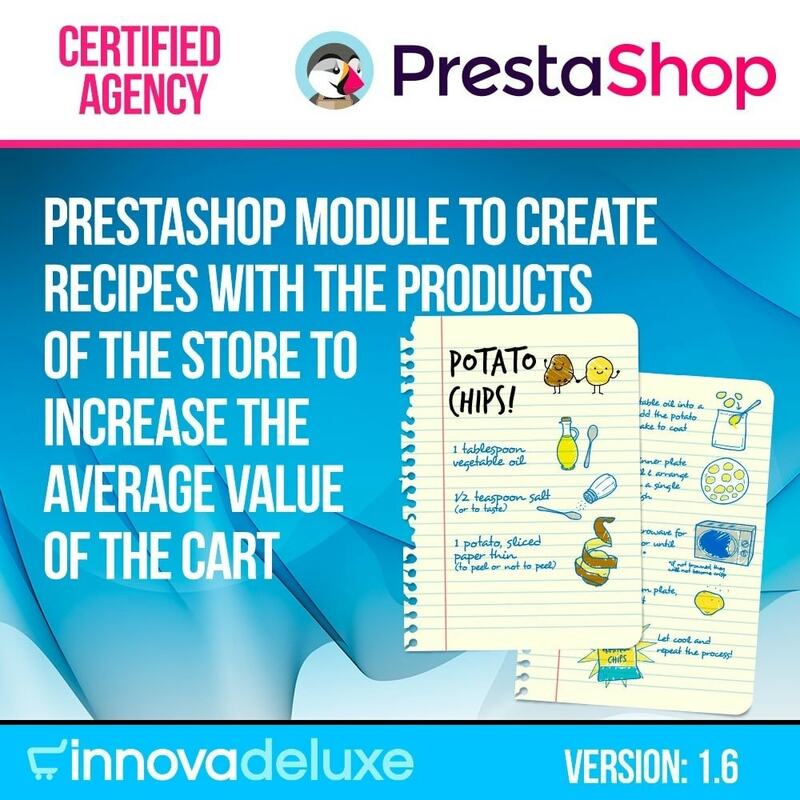 This type of module increases the user experience, customer satisfaction when buying in the store will be superior to other stores where they only sell products, as they provide content of value of great interest to the customer. 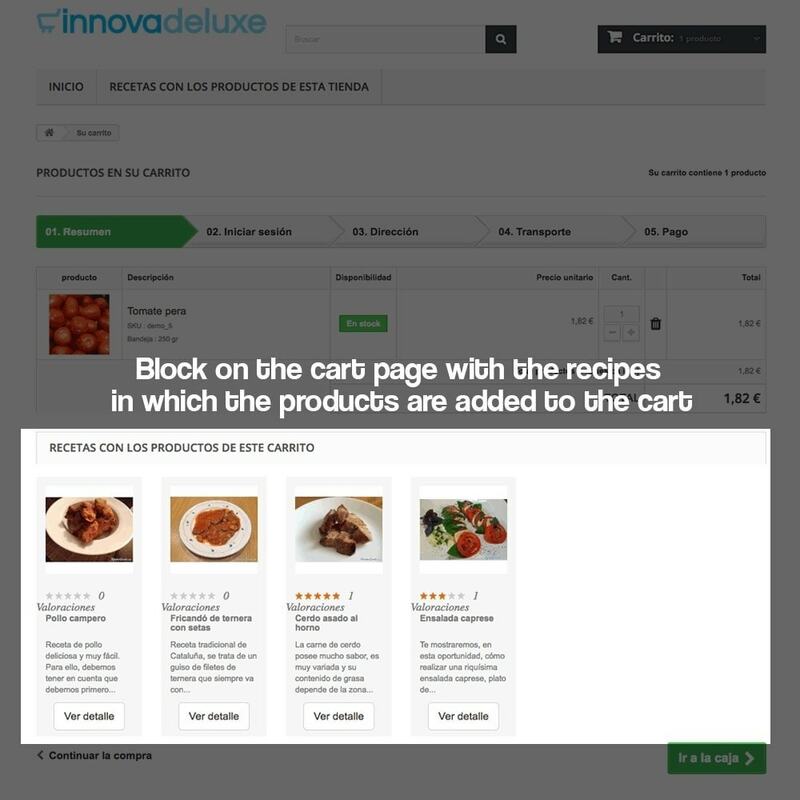 This module is recommended for shops where food products are sold, products to create ecological creations or elaboration of beverages such as craft beers among other types of products to which you can associate instructions for use.